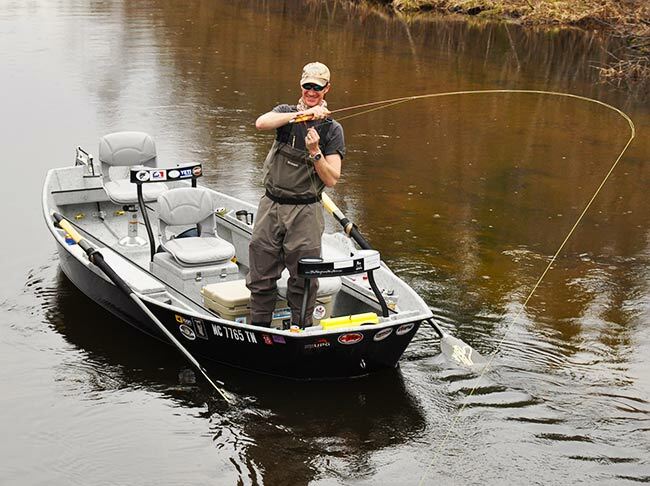 Northern Michigan guide Brian Kozminski in his new Adipose Flow. There are plenty of opportunities for impulsive purchases in the world of fly fishing. Buying a boat shouldn’t be one of them. You need to think about the types of water you fish (and would like to fish), do the research and take it slow. In my previous segment on choosing a boat, I spoke with Mike Batcke of Stealthcraft Driftboats and rowed their 15-foot Aftermath, an incredible heavy-water boat with tons upon tons of storage and fishing space. 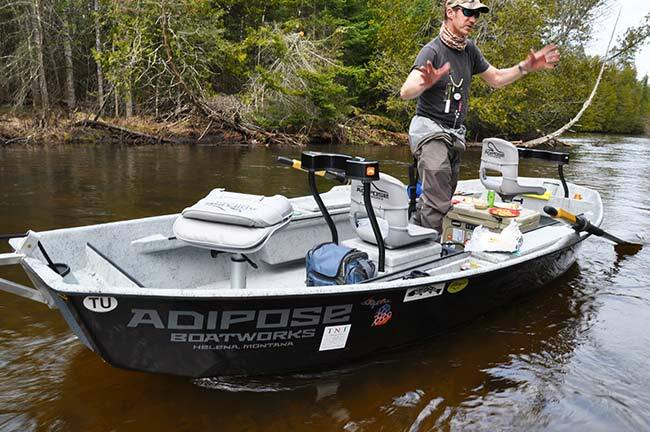 For this next segment, I decided to go in the opposite direction and check out a skiff that’s been the source of quite a bit of industry conversation—the Adipose Flow (you know a boat is something special when even competitors praise it in their off-the-record remarks). Last week I sat down with the mastermind behind the Flow, Adipose boat builder Tracy Allen, who along with owner Mike Ward is responsible for the birth of this unique watercraft. MC: How did you come to design this boat for Adipose? TA: Well, it’s a design that was a long time coming. I started guiding in Montana in the 80s, back when everyone was rowing a big Western style drift boat, and I came to the realization that there were a few serious disadvantages. First, it was really hard to maneuver. Second, it was tough to see over the high bow. The third problem was draft—you had to float it in the big channels where there was plenty of water; you couldn’t get over into the side channels to get at more fish when the angling pressure got heavy. Lastly, there was the issue of wind—those old boats weren’t easy to row in the wind day in and day out. So after many years of rowing those boats I knew I could come up with something better. I started putting ideas on a piece of paper and I came up with this totally new design and built some balsa wood prototypes. A friend of mine hooked me up with a small company and we built quite a few boats in the early 90s. The Koz Man getting set to shoot an old railway bridge. At the time the company I was with was having financial issues, so I told him I’d have to get him one that a competitor had made, which we did. A few days later he comes to me and says, “Hey, this boat is really incredible. Let’s get it back on again.” And that’s how this whole thing got started. On November 3, 2009, we walked into the new building and that’s where we are today. We’re not trying to build the most boats in the industry, but we’re trying to build the best. MC: What makes your skiff, or maybe skiffs in general, different from a traditional drift boat? TA: In general, a drift boat has that traditional teardrop- or football-shaped bottom; they’re generally higher on the sides and they have more rocker. 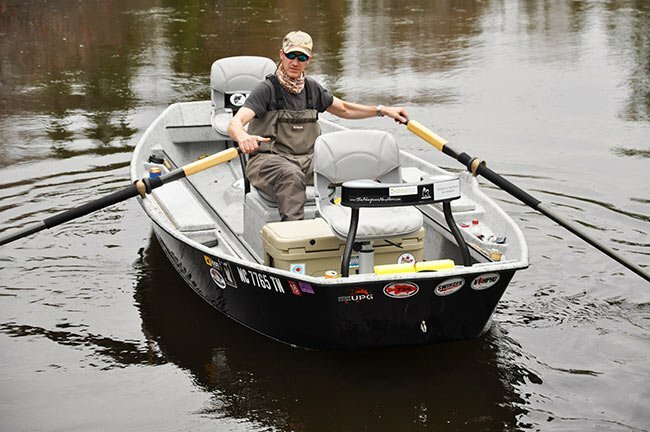 A skiff is designed to have more surface area on the water; it’s lower on the sides and has greater displacement in the front and rear of the boat. The chines on a skiff are straighter, whereas the chines on a drift boat have more curvature. The traditional Western drift boat was actually not designed for fly fishing. 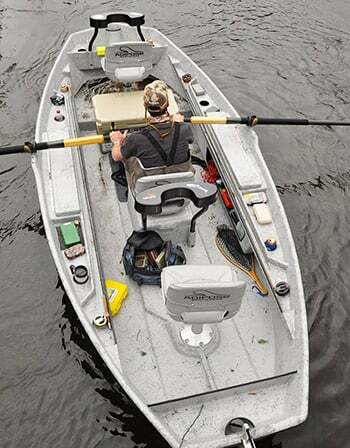 It was designed for two guys to sit at the front of the boat and pull plugs in a salmon or steelhead type situation. When I first started guiding in Montana, no drift boat had a rear casting brace in them. There were just two big seats in front. And those boats with two guys in the front of the boat rowed incredibly well, since that’s how the boat was designed. But when you put a guy in the back, it pushed down and raised the bow—not good. By going to a skiff style design, we were able to achieve more volume in the stern and bow of the boat. We also established a greater footprint on the water, which allowed us to be able to run lower sides. Finally, we accomplished superior angler displacement for a more balanced watercraft. Traditional drift boat manufacturers responded to this skiff style by adopting some of its features—widening the rear of the boat, straightening the chines some. But a skiff just takes all those elements to a whole other level. MC: Talk to us about your construction process. Big fish, big guy, empty boat, but stable as can be. TA: First, we build a hull mold. Then we wax the mold and spray in the gelcoat. We use an exceptionally strong proprietary material for the first bottom and the sides. Then we put a second layer in, and another layer in the chines for extra strong chines. Then we lay in our core, which is Plascore, which makes for tremendous structural rigidity in the bottom of the boat. Then on top of that we add another layer of Plascore. All of our parts and pieces are molded in the shop. We do it all ourselves. MC: There are a few other skiffs on the market. How is your skiff different from, say, a Hyde or a Ro? A big part of this incredible rowability has to do with where you put your seats and where you locate your balance points. I’ve worked really, really hard figuring out where those spots are going to work the best for all situations. Light guy in the front, heavier guy in the back. Heavy guy in the front, lighter guy in the back. And so on. How much and where you put weight in the boat makes a huge difference in terms of how the boat actually rows. Some manufacturers come out and say they make boats that are really light. But a really light boat catches wind easy. On the opposite end of the spectrum, a really heavy boat is harder to row. Here at Adipose, we’ve achieved a very happy medium in terms of weight and rowability. MC: You guys offer some interesting design configurations, like raised casting seats of the type typically found on bass boats. Can you talk about how that came about? TA: Well, one of my customers came to me with a seat he wanted built into his boat. It was a pneumatic, air-actuated bass boat seat. So we incorporated it into his boat, and soon everyone wanted one. In my past boats I’d used just a fixed pedestal seat. I had found a happy medium between where a shorter person and a taller person would feel comfortable. But with the air-actuated seats, we were able to accommodate shorter and taller people without compromising the comfort of either. Push the seat down all the way and you’re ready for spooky fish late in the season, fish that have been fished over by a lot of guys. By putting the seat low and taking advantage of the boat’s low profile, you can get at fish that you just wouldn’t have access to if you were standing up and waving your arms around. Conversely, you can bump the seat up all the way and comfortably cast streamers sitting down—there’s only about a four inch difference between sitting and standing. But of course, you can configure it any way you want—for example, pneumatic seats with removable casting braces. You can switch from sitting to standing in the brace as you please. Our boats are very utilitarian. You can have a guy in the front standing up with a casting brace and a guy in the back sitting down with no casting brace. Both sitting down, both standing up. Our braces are also smaller and more aerodynamic than what you find in other boats. They don’t catch line as much. They store quickly and easily in the side storage area. MC: Anything else you’d like people to know about your boat? TA: They might be interested to learn just how much the boat was born to be fished. The first part of the design was two parallel lines on a piece of paper—the rod braces. Our boat is designed to fit ten foot rods with no curvature. You can fit three rods on each side and just go back and forth from a dry fly rod to a streamer rod to a nymph rod. The necessity of fitting ten foot rods with no curvature is one of the things that accounts for the size of the footprint of the boat, and for the fact that it’s also a complete walk-around. A boat built up and around from the rod braces. I spent the remainder of the day up front casting. True to touting, the Flow made for an exceptional stable fishing platform. It was definitely the most stable skiff I’d been in—no technical formations necessary when changing rowers, or when everyone in the boat leans the same way while fighting and netting a good fish. But the best thing about the interior design was how the fishing platform could be modified depending on what I was throwing. I could be sitting down in the pedestal seat, casting dries with my feet tucked back underneath me, then pop right up into the casting brace, which was small but comfortable (it was also a piece of cake to take out and store in the side hatch). Verdict: The Adipose Flow is a serious contender. A boat I look forward to fishing in and rowing again, possibly permanently (time, and a few more reviews, will tell). So if you’re in the market for a generously sized, stable skiff that tracks true and accommodates any fishing style or configuration you can dream up, this boat needs to be part of your boat-buying conversation.